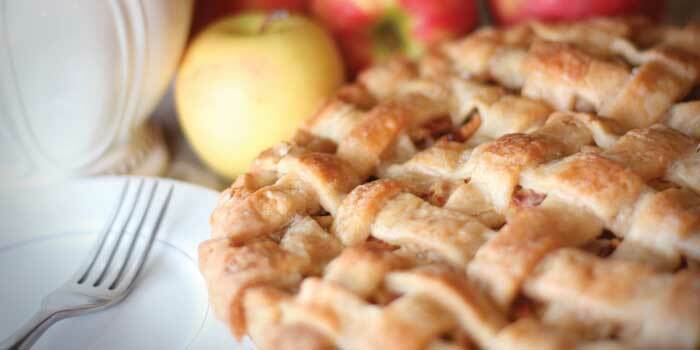 A couple in Mooresville rolls out crusts, stirs together fillings, and makes homemade pies for you to purchase. Steve Lindberg wants to make pies like your grandmother made. If your grandmother didn’t make pies, he wants to make the best pie you’ve ever tasted. “When you go buy a store-bought pie, you’re settling,” Steve says. His shirt and cap have a logo with a steaming, latticed pie and the words “Carolina Pie Company.” Carolina Pie is his company. Bringing homemade pies to your table is his mission. Steve founded the company with his wife, Barb, three years ago. He worked as a chief financial officer for much of his life but decided to return to his roots. His grandfather, who lived in Massachusetts, started a bakery in the 1930s, and his father continued the business. Steve and Barb lease a small kitchen located along N.C. Highway 150 in Mooresville. Ingredients for piecrust line the shelves, and the smell of a cooling bumbleberry pie fills the room. The blue-and-purple mixed-berry filling almost bursts out one side of the buttery crust. The low hum of one of the ovens signals an apple-and-caramel pie is almost finished. Steve and Barb press out the crust by hand and finish the pies with a lattice top. “When we started, I couldn’t make a pie,” Barb says. Latticing was the hardest part for her to learn, but after Steve’s instruction, she can now make a pie with her eyes closed. The attention to detail and quality is catching on with the community, and demand for the pies often exceeds supply. Derrike Cope, a Mooresville resident and 1990 Daytona 500 champion, has the Carolina Pie logo on his team car, which competes in NASCAR races across the country. Cope says the pies remind him of his grandmother’s and the activities that went into making them, such as picking blackberries. As a racecar driver, he maintains a strict diet, but when he cheats, he goes with the strawberry pie. To order, contact sales@carolinapie.com, or visit the website, carolinapie.com, for a list of retail locations. Dixon is a reporter for The Herald-Sun in Durham, and a graduate of the University of North Carolina at Chapel Hill.